My father bought me this boook last week and I've been reading slowly... trying to soak in the new knowledge. Trying to turn it into wisdom. I'm highly excited about many of the things I have already read. What the author, Wayne W. Dyer, shares is some of the truths he's picked up along life's journey on how to co-create your world. I think the book is great. Some people may have to build up to reading something as heavy yet simple as the power of intention. I do have to say that this book is easier reading than A New Earth -- the book Oprah has been touting for a couple months. This book is far less complicated than A New Earth yet stresses the same principles. Essentially, both books are talking about the same universal laws. 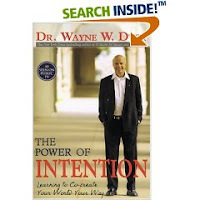 My opinion is that The Power of Intention is easier to assimilate into your everyday life. If you become what you think about, and what you think about is getting what you want, then you'll stay in a state of wanting. So, the answer to how to get what you want is to reframe the question to: How do I go about getting what I intend to create? Lately I've been highly unsatisfied with my job/career. If it were up to me, I'd probably be doing something artsy -- sculpting, photography, creative writing -- something along those lines. I wouldn't be working as a Buyer/Supervisor in a distribution center. You get where I'm going with that? Why am I not doing what I'd rather be doing? Why am I not filling my life with things that I love? Fear of the unknown is what keeps me right in place, succumbing to the monotony of the rat race to support myself and my family. Life is so predictable in the rat race versus the unpredictability of seeking out my own creative endeavors to sustain me. I long to know what the Creator would have me give to the world. What great work must I do to complete my task on the planet? One of my most favorite scriptures in the Old Testament is Psalms 46:10 which reads, Be still and know that I am God. In my effort to find out what I am and why I was placed on this planet, I must first BE STILL and listen for the Creators voice to guide me along. I will put my hand in HIS and let him gently lead me. All this from a single passage in a book? Yup! I dare you to read the book! Sounds like a really good book...don't you love when you get good books? I do!